ROOTSTOWN, OHIO – Members of Northeast Ohio Medical University’s College of Medicine and the University’s Wasson Center for Clinical Skills Training, Assessment, and Scholarship earned top honors for their poster presentation, “Teaching and Fostering Empathetic Touch and Eye Gaze,” at the Directors of Clinical Skills (DOCS) Annual Meeting held in Austin, Texas, Nov. 2, 2018. 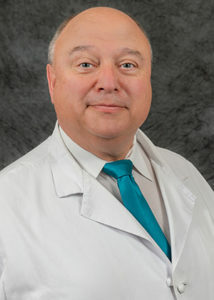 The poster was presented by Paul Lecat, M.D., professor and internal medicine clerkship clinical experience director. Dr. Lecat led a team of University representatives in the study, which gives credence to the importance of touch as a means of showing empathy. By using two three-minute videos that showcased standardized patients and their expressed desire to experience empathy from physicians, the NEOMED study validated students’ inclination to show empathy and alleviated any concerns about touching patients. Handshakes don’t count, and neither do blood pressure checks, students were told. One-fourth of the students who had previously been reluctant were no longer concerned after watching the videos. Dr. Lecat, although not surprised by the change in the students’ perceptions, said he was surprised by the reaction of the poster presentation judges. There were about 30 posters presented and while most highlighted best practices in clinical skills, NEOMED’s was praised for being innovative and well-designed, and for presenting valuable new information. Members of the NEOMED team who contributed to the study include Naveen Dhawan, M.B.A., Paul Hartung, Ph.D., Holly Gerzina, Ph.D., Robert Larson, M.A., and Cassandra Konen-Butler, M.A. Approximately 200 educators from many of the top medical universities across the country attended the conference, which provides workshops and presentations on crucial clinical skills like history taking and physical exams. For more than 40 years, Northeast Ohio Medical University (NEOMED) has worked in collaboration with its educational, clinical and research partners to successfully train health professionals and medical researchers who serve and impact the region and beyond. The University trains students in a team-based, interprofessional environment and offers Doctor of Medicine (M.D.) and Doctor of Pharmacy (Pharm.D.) degrees, in addition to master’s and doctoral degrees and research opportunities in other medical areas. www.neomed.edu.